Are you already using Pinterest to drive traffic to your blog or website? If you’re not, you are missing on a lot of potential customers and if you are already using this image-sharing platform but not getting good results, you must not be doing it the right way. In this article, we are going to share some awesome tips to help you drive traffic from Pinterest. We will also try to break the myth that Pinterest is only for women to share fashion, recipes and DIY project images. Pinterest has been around for a few years now, and in just a few years it has become one of the most popular social networking platforms on the internet. It was also the fastest growing social platform of the year 2016. So, you better think twice before underestimating the importance of this visual search engine for driving traffic. 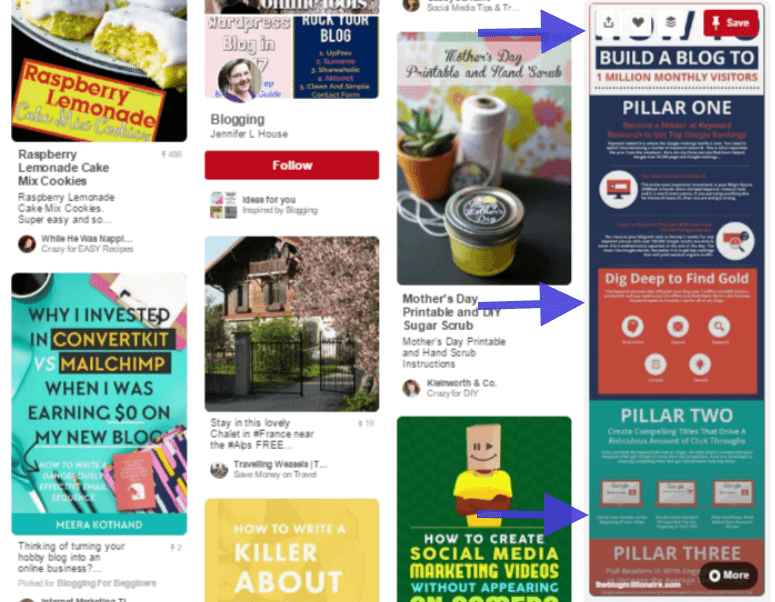 Wondering how to get more traffic from Pinterest? Here are some proven methods you can follow to increase your blog traffic coming from pins. Scheduling is the best way to ensure regular posting on social media to keep your users engaged even if you are not there. Although Pinterest doesn’t provide any inbuilt mechanism for scheduling of pins for later, it supports many third party social media sharing tools like ViralTag, Viralwoot, TailWind, etc. You can easily use any of these tools to schedule your future posts on Pinterest. I have a good experience using ViralTag for my scheduling my Pins. Viraltag is a very popular social tool that allows you to add and schedule posts for a number of social networking sites including Pinterest. This way you can schedule a number of posts in one go to make sure to keep your users entertained with new, fresh images. This will also ensure a continuous flow of traffic from Pinterest account to different posts on your blog. To utilize the full benefits of your Pinterest marketing efforts, make sure to create free a business account for your website. You can also convert your existing account to a business account for free. With a business account, you get access to various Pinterest tools like analytics and Rich pins. 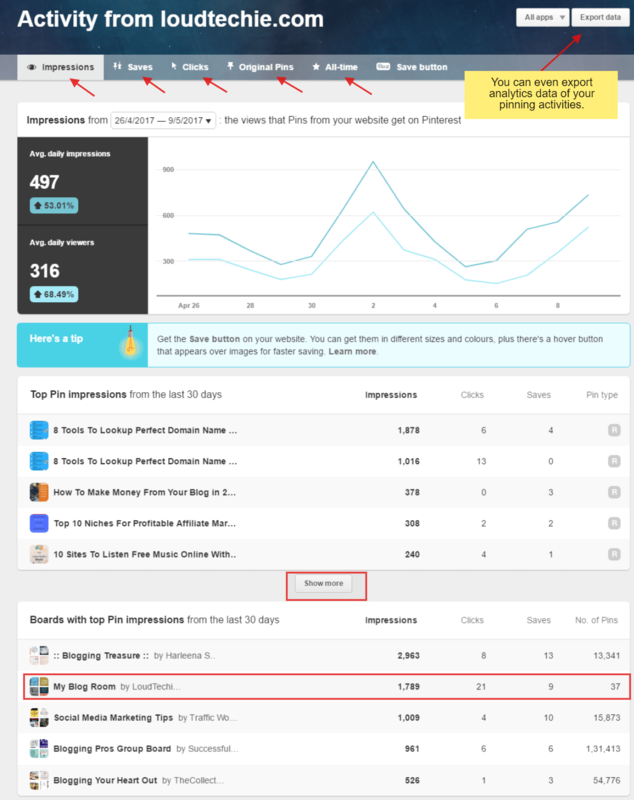 Your Pinterest Analytics is one free in-depth analytics tool for all your pinning activities. 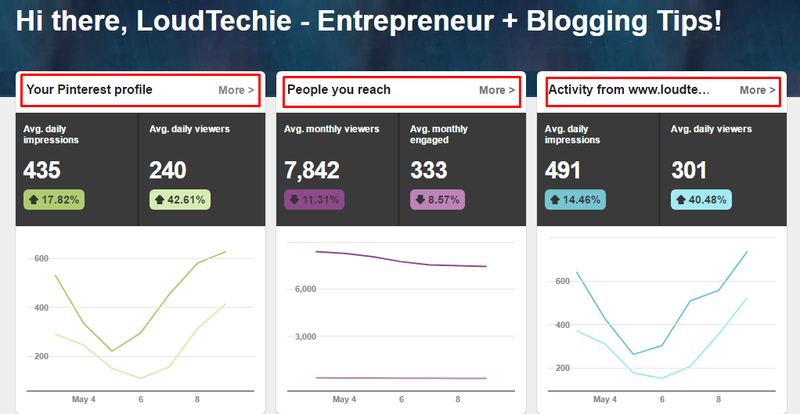 As you can see in the image below there are three analytics options; Your Pinterest profile, People your reach, activity from "www.yoursite.com". Pinterest analytics tool lets you keep track of the performance of your pins. You will know which pins are getting more engagement than the others. Here you can check my pinning activity for the last 30 days. Rich Pins are explained ahead, it help to assign more valuable information to your Pinnings. It also supports the Facebook Open Graph metadata if enabled on your website/blog. Other useful business tools include Video library, Pinterest guides, and Marketing blog. Rich Pins are perfect for people looking to increase engagement on their Pins. Rich Pins include metadata information of the concerned page or post attached to the Pin. This is a wonderful way to tell your users more about a Pin; it also helps in search engine listings. For this to work, you first need to add metadata (Meta tags) to the pages on your website. This may include the type of content, such as article, recipe, movie, product, etc. Two step process for setting up Rich Pins. After that, you need to apply for Rich Pins by verifying your website URL using the Pinterest metadata validator. After successful verification of your website, any Pin from your website will automatically be treated as a Rich Pin and it will include the metadata information of the page. This will help you drive traffic from Pinterest. The ability of a Pin to drive users to your website depends on its quality and optimization. Follow the points below to make better Pins. Image Size Matters: Create awesome-looking, perfect size, and absolutely stunning images. Read the Image Optimization point for more details. Description about Image Post: Use a short and to-the-point description with each pin. It may include your blog title, one line description, and a call-to-action. The description must explain what your pin is exactly about. Catchy Title: It must be attractive and engaging. Your blog post title must be catchy enough to make users click on your Pin. Not all images are pinnable; once you understand this, you’re ready to create some pin-worthy images. Hundreds of images are added and shared on Pinterest daily. So, what makes them shareable? Mind the following things to create Pinnable images. As you may already know, most of the images shared on Pinterest are vertical. This is because more than 80% of Pinterest traffic is generated from mobile, so users naturally prefer taller images. Long size pin images always have better chance to get more saves. A perfect visual content graphic image size is 735px X 1102px. And a minimum Infographic image size is 800px X 2000px. Make sure that your image is right-sized. The image you are using must be absolutely stunning. A perfect pinnable image shouldn’t have any human faces but should have vibrant colors, Informative content, a complementing background, red tones, and more light. Make sure to use only high-quality images. Include relevant and engaging text in the image. Use visual content designing tools like Picmonkey, Canva, and others to edit images and to add text to them. 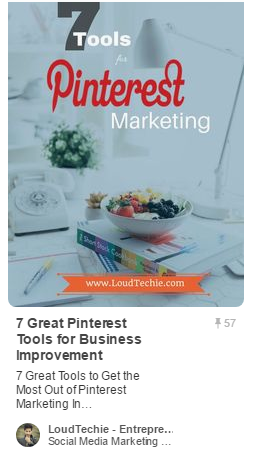 Pinterest is the most beneficial if you can share the right Pins at the right time. It is of no value to pin new posts when most of your target audience is sleeping. To make sure that your Pins reach to the most number of people and to increase repins, you must share at the right time. Use the Pinterest analytics tool to determine which of your Pins are getting more engagement and when. Many studies have revealed that Saturday morning is the best time to pin, for most niches. For fashion and shopping industry, the best pinning time if Friday afternoon. And the worst pinning time is during regular working hours, for all. 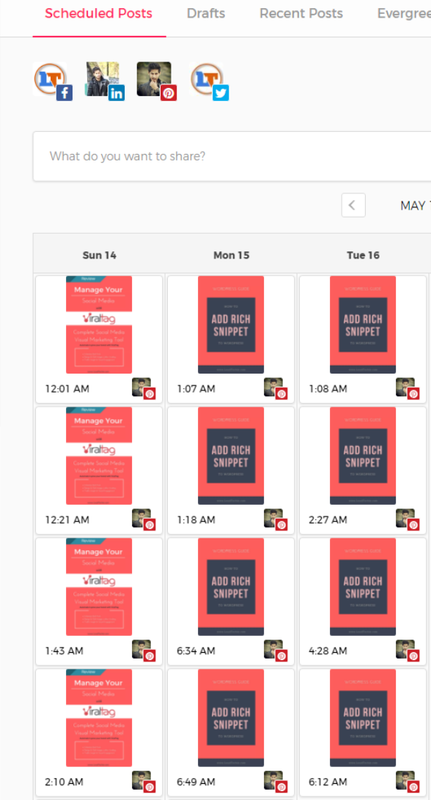 You can also go through this case study by buffer on science of Pinterest scheduling. 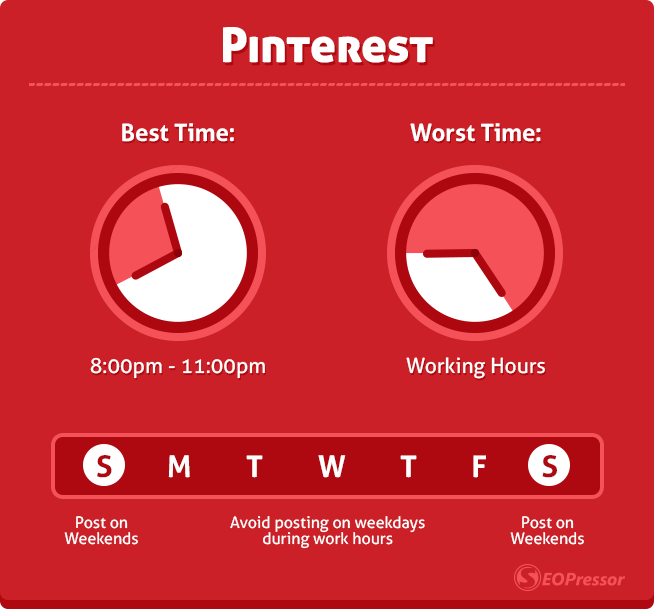 All you have to do is figure out the best time to pin when most of your target users are online. And then, share the best of your Pins with them. Similar to Facebook and other social sites, Pinterest also has several group boards for every industry. You can join these groups to reach more of your business target audience. You must be a member of a group board to be able to pin there. A Pinterest community board is the best place to promote your Pins. The members of a specific community already like a particular type of products and Pins. So chances are they will also like your pins if you regularly share stunning images. This is a wonderful way to get instant traffic to your blog or website without putting much effort. You can search on PinGroupie to find out your relevant group boards to join and start sending membership requests. Pinterest also lets you create your own group board and add members to it. Although it takes time to build reputation for a new board, but it is worth the time and effort. Pinterest is also an amazing place to develop strong social networks. By following these simple points, you can easily improve Pinterest Traffic to your website or blog. So follow the above mentioned methods and boost your Pins engagement and traffic from Pinterest to your blog. If you think I have missed any possible way to generate traffic from Pinterest, share your method with us using comment box below. I would love to hear about it. If you like this article you can follow us on Facebook, Twitter and Pinterest.